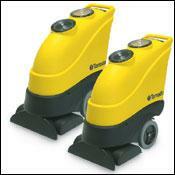 Automatically flush, scrub and vacuum carpets in one pass, with our Marathon units. Everything is built in - the power wand, vacuum motor, demand pump, bladder solution tank, poly recovery tank. Unlike all other units, these cleaners utilize a clever patented internal bladder design system that maintains constant brush pressure on the surface regardless of the position of the water in the tank. In addition, the bladder design has allowed our designers to shrink the "footprint" of the unit to allow for easier transport, storage and better sight lines for the operator. Other features include easy view fluid lids, service friendly, one bolt, clam shell design, well thought out cord management and convenient drain system. In short, state of the art, user friendly and easy to service design has made these units one of our most popular sellers. 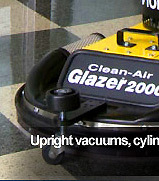 Cleaners come in both 8 gallon (98166) and 12 gallon (98168) sizes.